To minimize such risks, airport operators employ a variety of strategies. 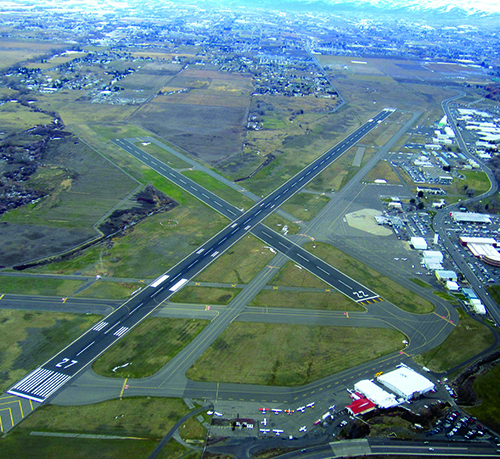 Yakima Air Terminal-McAllister Field (YKM) in Washington state and Vancouver International Airport (YVR) in British Columbia both have formidable wildlife challenges they choose to face head on. This summer, YKM received a Washington State Airport Wildlife Award for the proactive measures it has taken. Nestled in a valley between several mountain ranges, YKM has a diverse ecosystem to manage. Three streams run directly through the airport’s property, but the climate is dry enough for tumbleweeds to be a common part of the landscape. Coyotes come out of neighboring forests to catch small animals, especially pocket gophers that like to dig underneath the airfield’s security fences. In short, the full circle of life can be seen at the airport. Peterson consequently stresses the importance of monitoring and tracking hazards, versus just reporting incidents. “Opportunities have come up in the past few years on our wildlife priority list to ensure we’re addressing projects such as infrastructure, vegetation management as well as airport landscaping to minimize wildlife strikes,” he notes. His team uses standard Excel spreadsheets to document and categorize the movement of various wildlife. “It’s a good foundation to bring to the annual meeting with the USDA, so we can talk about what we’re seeing and also identify changes over time—what types of species come and go, as well as patterns in occurrences,” Peterson explains. 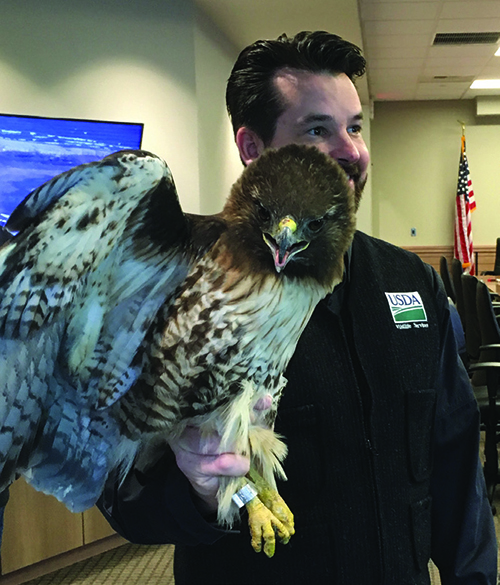 For the last four years, YKM has banded together with nearby airports in Moses Lake, Richland, Prosser and Walla Walla to collaborate about ways to deter wildlife. The strategy has proved effective, as many of the airports encounter the same species of birds and critters. Each year, employees from YKM and other airports receive wildlife training from the USDA. This coordinated effort not only saves the USDA time and money, but also helps the airports identify common issues and solutions. This year, the main priority at YKM has been vegetation management. The maintenance crew is making extra efforts to keep lawns mowed and remove vegetation such as berry-producing bushes that attract wildlife. Removing a variety of trees inside the air operations area to ensure wildlife are not perching there was a key focus, and Peterson had no qualms about getting rid of the trees. “Passenger safety is the top priority, and removing trees has actually allowed a nicer view of the airport terminal,” he explains. Schafer notes that airport executives often face conflicting mandates associated with multiple environmental, water quality and wildlife habitat requirements. Add in the need to maintain an aesthetically attractive campus, and the job gets even more complicated. “It’s really difficult, but the bottom line is that we have to protect public safety—and sometimes that comes at the cost of landscaping,” he says. Schafer says that YKM excels in three important areas: training its staff, providing the tools they need and trusting their judgment. Peterson notes that one key part of the effort has been explaining to ground personnel and airport tenants that open garbage containers are strong wildlife attractants. Like YKM, Vancouver International Airport (YVR) uses data to track how various wildlife move about the airfield—and help identify the risks they present. Lately, its efforts have taken a high-tech turn. 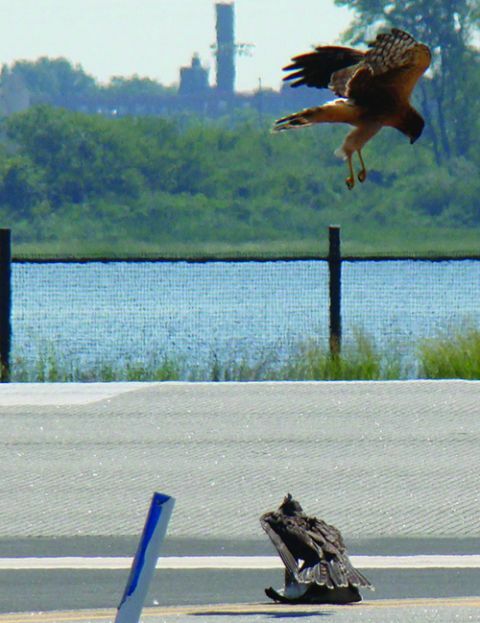 Since May, the Sea Island airport has been using avian radar to track bird movement. 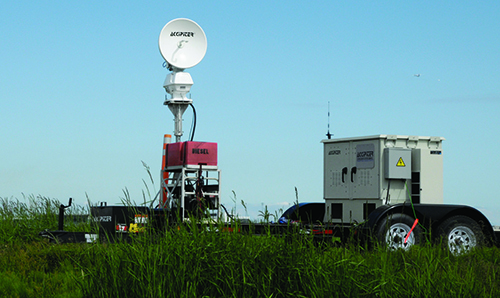 After exploring numerous options at trade shows and conventions, the Vancouver Airport Authority partnered with Accipiter Radar Technologies for a one-year equipment lease. Airport personnel were familiar with the Ontario company because of its strong connection and work with the Bird Strike Association of Canada. With growing confidence in the radar’s ability to track birds and help its team understand movement patterns, the airport will begin using the data to help guide strategy decisions. Better field information will help YVR be more effective quantifying daily patterns, forecasting bird activity and deploying wildlife personnel to key areas at the appropriate times, explains Bradbeer. He encourages other airports to have a true understanding of the data they collect before acting on it. Habitat management—making the airfield less attractive for birds and other animals—is another main pillar of YVR’s wildlife program. “We also work on drainage, to remove ponded water,” says Bradbeer. “Despite our best efforts, birds will come to find food; and then we have to try and change their behavior. “It’s our responsibility to ensure safe aircraft operations while conserving wildlife,” he summarizes. While YVR’s new avian radar is helping it track birds more effectively, the airport also deploys a variety of pyrotechnics, sirens, trained raptors and dogs to move birds off the airfield. In a similar vein, personnel at YKM use sirens, horns, “bird bangers” that make firecracker noises, and “screamers” that whistle like bottle rockets. “We do everything we can non-lethally to scare them away,” says Peterson. According to the USDA, fully 92% of bird strikes occur at low altitudes—below 3,500 feet. In essence, both airports are “playing the odds” by working to keep birds and other animals off their airfields. Minimizing the food and habitats they prefer helps encourage wildlife to take up residence a safe distance from active air traffic.